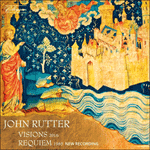 Visions was the result of a most unusual invitation: to write a piece combining solo violin, string ensemble (to which I added a harp), and the boy choristers of the Temple Church choir. The occasion was a concert at the Temple Church in London forming part of the 2016 Menuhin Competition, at which two past winners of that renowned violin competition were to perform. My assigned soloist was the dazzling 19-year-old Canadian violinist Kerson Leong. Having immediately decided to accept, my thoughts soon turned to the historic associations of the Temple Church with the Knights Templar—the church takes its name from the Temple at Jerusalem, and the round shape of its most ancient part is a deliberate echo of the Church of the Holy Sepulchre. ‘Jerusalem’ is of course more than the name of a middle-eastern city: it stands as a symbol both of God’s people and of a utopian ideal of heavenly peace and seraphic bliss in store for redeemed humanity. I chose four biblical texts which express different aspects of this vision—(1) an introductory description of the imagined city in the words and Gregorian melody of a medieval hymn familiar in the English version beginning ‘Blessed city, heavenly Salem’; (2) Isaiah’s prophetic vision of the coming of Messiah, followed by a lively section which might be a dance of the daughters of Jerusalem; (3) a lament for the desolation of Sion, using a transmuted fragment of both text and melody line from William Byrd’s anthem Bow thine ear, O Lord; and (4), a beatific vision of the holy city as seen by St John in the Book of Revelation. As a royal bride arrayed. Those who earthly trials bore. Arise, shine; for thy light is come, and the glory of the Lord is risen upon thee. And the Gentiles shall come to thy light, and kings to the brightness of thy rising. For behold, I create Jerusalem a rejoicing, and her people a joy. Jerusalem, Jerusalem, desolate and void. I saw the holy city, new Jerusalem: alleluia. And the city was pure gold, like unto clear glass. And I saw no temple therein: for the Lord God Almighty and the Lamb are the temple of it. And the city had no need of the sun, neither of the moon, to shine in it: for the glory of God did lighten it, and the Lamb is the light thereof.